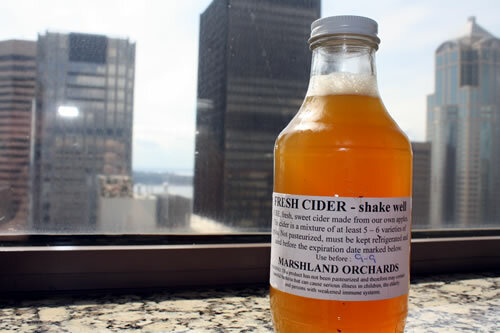 Enjoying fresh, local, unprocessed cider in my hotel room in Seattle. Temptations in the form of packaged snacks and neon fast food signs beckon from the terminal as you race to make your connection, starving because you just woke up from the red-eye cross-country flight and knowing you have another four hours of travel between that puddle-jumper and the lengthy drive to your destination. This scenario may not be one you have faced (I did five weeks ago) but the sentiment of harried travel can be felt whether you are a frequent traveler or fly once every few years. However, traveling unprocessed is not as challenging as it may appear. You do not need to succumb to the sultry sundries in their processed packaging. As someone who is on the road more weekends than I am home, I have compiled a number of tips for your next trip. Blogging from 30,000 feet and enjoying unprocessed treats. Airports and planes will sell you processed fare at high costs, so planning and packing will allow you to eat unprocessed and save money to boot. Consider what time of day it will be. Can you eat before you travel? How long will you be traveling? What are your plans when you land? 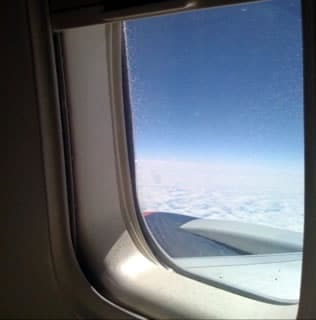 Will you be able to find healthy eats upon landing or do you need to pack a little extra snackage? I make goodies to bring along on my travels. From Kale Chips to Pear Chips, drying your own produce keeps snacking healthy and also allows you to purchase local fare to enjoy that may not travel well in fresh form. You can also make or buy granola bars (check the ingredients if you are buying! ), although these tend to be calorie-dense, so don’t pack too many for a flight. I also bring raw almonds and fresh produce like carrots and apples. Dairy enthusiast? Pack cheese slices and unprocessed crackers or bread. Meat eater? Make your own jerky or grab mini cans or packets of tuna packed in water (keep it under three ounces and toss it into your liquids Ziploc!). If my trips are long, I might pack a sandwich to pair with my other goodies. Finally, bring your own empty water bottle. You can fill it up once you go through security. This will save you money and save plastic bottles! If toting goods surpasses your carry-on limits and you are willing to shell out a little extra cash, a number of airports are now offering healthier fare. I’ve found fresh gourmet goodies at most of the larger airports, however based on the time of day you are flying they may not be open. Smaller airports are a bit dicey so check out the airport web site before traveling. Just remember to ask questions on how your food is being prepared, and keep it fresh! 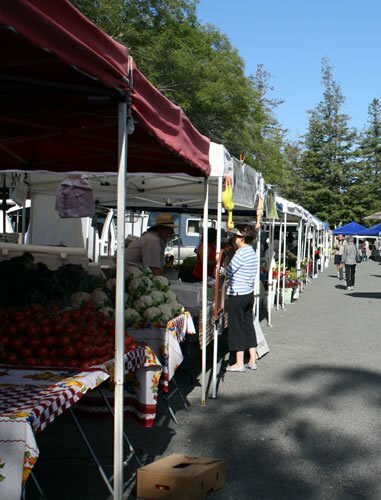 Explore local markets when you arrive at your destination for fresh, unprocessed fare. If you are traveling for several days, you will either be dining out a fair amount or preparing food in your hotel room. Call your hotel in advance to see if there will be a refrigerator in your room. As a teacher, I sometimes need to store medications, and hotels usually have refrigerators that they can bring up either for free or a small fee. Don’t be afraid to ask! I always make it a point to visit a grocery store the first day I am in a new town. Not only because I love uncovering new food finds, but it also gives me a chance to pick up some staples for my makeshift hotel “kitchen.” I have been known to pack my mini blender to make breakfast smoothies and nut butter, but you don’t have to get as adventurous. You can hit up the salad bar at Whole Foods for pre-cooked grains and hard-boiled eggs to store for cold salads. If you don’t have a refrigerator, then stick with staples like the ones recommended for plane trips. Finally, use this trip as a chance to explore local fare. Using Twitter and restaurant sites like Yelp, you can search for restaurants that use regional products to produce unprocessed meals. My students can tell you that we have discovered some amazing food by avoiding the chains and hitting up the small local venues during our travels. 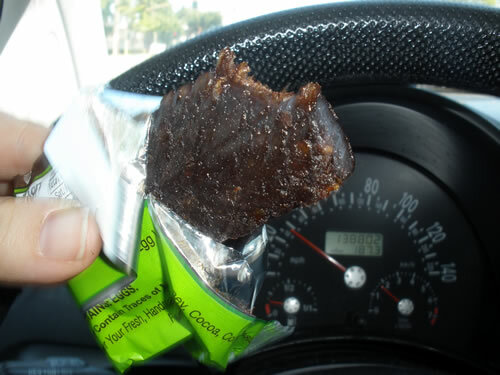 Enjoying an unprocessed, self-designed "YouBar" on the road. My family rarely flew for family vacations, and even in college our debate team took many van trips to get to competitions. Road trips, whether for business or pleasure, can be an opportunity for gourmet eats or can be a disaster for unprocessed eaters. You can already guess that planning ahead is crucial. Whether you pick a hot spot you want to hit on your trip, or you frequent the local produce stands on the side of the road, you don’t have to live on French fries and soda pop while cruising down the interstate. Packing for a road trip can be an adventure. If you don’t want to stop along the way for food, then consider preparing your meals in advance. Homemade gourmet sandwiches, fresh whole grain and vegetable salads, pre-washed and prepped fruits and vegetables, and any other unprocessed munchies you can dream up. Pack a small cooler full of freshness — just make sure to keep your food stored at proper temperatures because no one wants to get ill on the road! 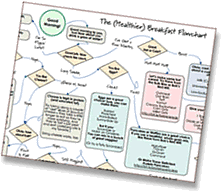 Traveling, for work or play, doesn’t have to derail your unprocessed pledge. You can use these trips as an opportunity to explore new foods and places. Plan ahead, keep it simple, keep it local, and ensure you get a balanced mix of proteins, whole grains, fruits, vegetables, and healthy fats. This will keep you feeling energized and ready to tackle whatever adventures your travels may lead you to. Bon voyage! Carol (CGtheFoodie) is a full-time communication studies instructor and high school debate coach. She travels the country throughout the school year, taking her students to debate competitions. Growing up in Northern California, she has always had an interest in local and unprocessed foods, and now shares her healthy recipes and food-finds at Uncovering Food. Thank you for your travel tips. I’m leaving for a visit to see family and friends and to attend parent’s weekend at my daughter’s college. My family is immersed in the processed food culture and I’m not looking forward to the conflicts and the temptations (childhood comfort foods will be awaiting me). I’m hoping to impart some healthier methods to create some of those foods and to show them that eating unprocessed is easy and inexpensive. Still, at this point it looks daunting. Wish me luck! Family is definitely the toughest — food is such a huge part of family culture (as it should be), that if/when you want to do something different, it can be taken as an affront. I’ve found that the only thing we can really do is to be enthusiastic and to lead by example, and hopefully that will open minds and mouths. Check in on twitter when they’re not looking — we’ll be sure to send you words of encouragement from there! One thing that has really helped me find better food options hen I travel is taking one of those navigation systems even if I’m not actually driving. You can pull up all of the local grocery stores and restaurants without needing a computer or internet connection. This is a great idea Derek. I use my phone (with Google Maps) to do this. I’ve also downloaded apps for local farmer’s markets, which can be helpful too! Learning the healthiest options at various large chains has really helped me a lot. Starbucks, in particular, has some good options, and they’re everywhere. In a pinch, I’ll grab their Oatmeal (sans brown sugar), a Protein Plate, or even just a banana. Hey! I wrote up a similar post when the hubby and I went camping and visted family all in one trip! Sun-dried tomatoes and homemade trial mixes does the trick for us. Also, olives (bought at the Farmer’s Market), nut butters, and dried fruit keep well on road trips and can be taken on your carry-on. Camping in the Grand Canyon was a little tough, because we had to carry all of our food for 48 hours in high heat. Backpack’s Pantry has a line of organic camping food, it was the best we could do. Thanks for all of your ideas! I also like bringing along string cheese — although the individually-wrapped sticks generate a fair amount of trash, they tend to keep longer on the road. They’re really fine after a day or two of camping, as long as they’ve been sealed. (The whole point of cheese is preservation, right? ).